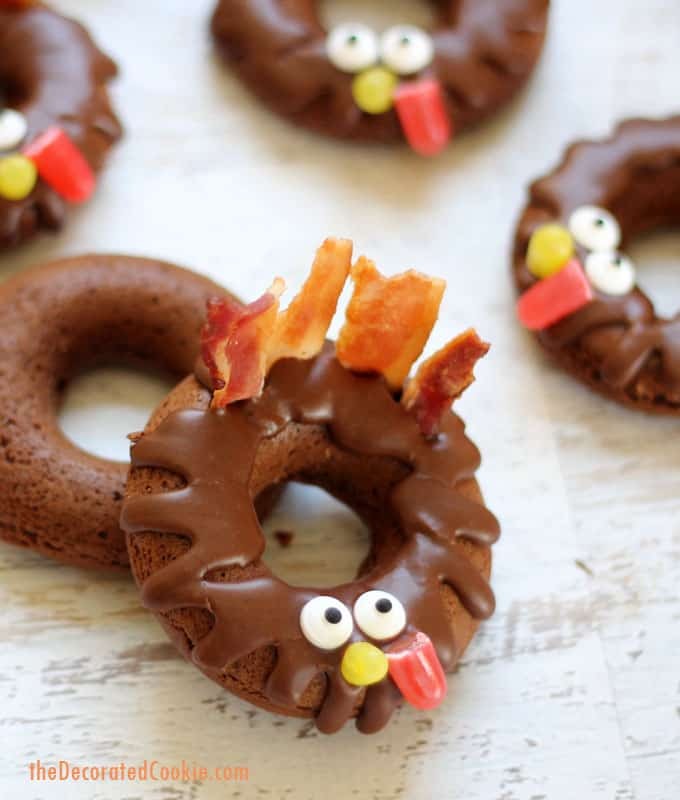 DONUT TURKEYS -- baked chocolate doughnuts for Thanksgiving fun. I, like the significant majority of those around me, adore donuts and bacon. So trying to think of some fun food ideas for Thanksgiving, I of course had to find a way to put those two things together. I got (or, rather, chose, because why didn’t I own this yet?) 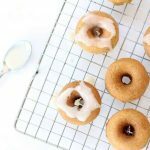 my new favorite bakeware recently, the Wilton® non-stick mega donut pan, so now it’s going to be all baked donuts all the time. 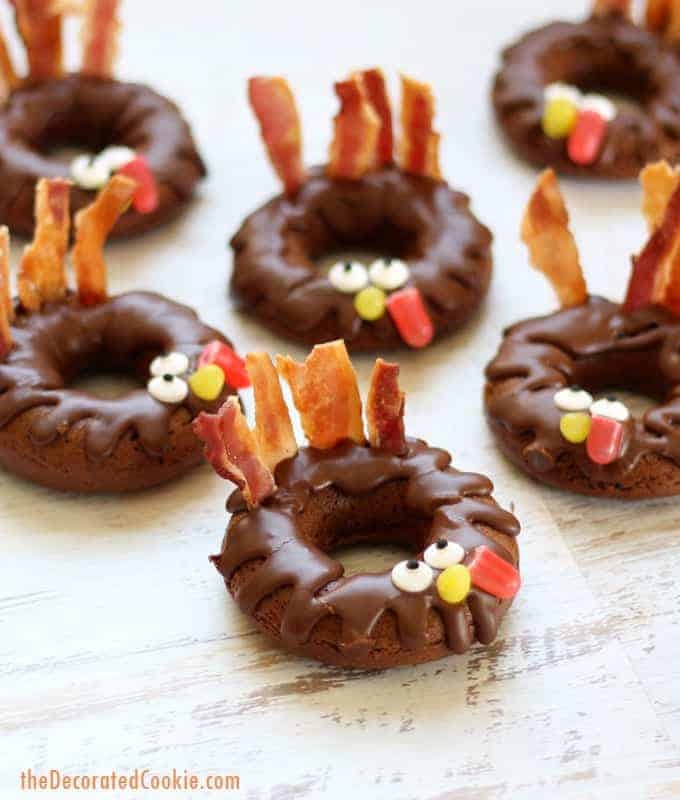 The donut pan works beautifully to make perfect donut rings, and here, I used it to make baked chocolate donut turkeys. 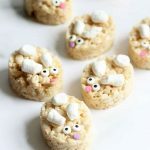 Need more fun food ideas for Thanksgiving? Check out these turkeys. 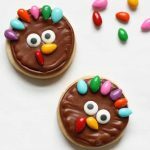 A few notes on these donut turkeys: You can use any of your favorite recipes for baked chocolate donuts, although I include my recipe below that I love. For a different flavor, add some nutmeg. For extra chocolaty flavor, add a bit of chocolate extract (both of these are optional). 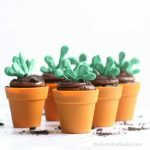 I also include a recipe for chocolate glaze below, but you may also use store-bought chocolate frosting and thin it a bit with milk to the right consistency. For the candies, I used Wilton® candy eyes and Mike and Ike’s for the beak and wattle. 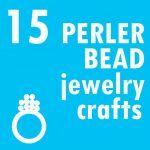 You may use any comparable yellow and red candies you like, or use candy corn if you have any leftover from Halloween. I cooked my bacon on the crisper side so I could stand it more easily in the donut. The chocolate glaze will also help secure it. 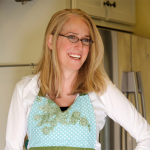 Crisper bacon crumbles more easily, so you may want to make some extra bacon just in case. Then you get to eat more bacon if nothing crumbles. 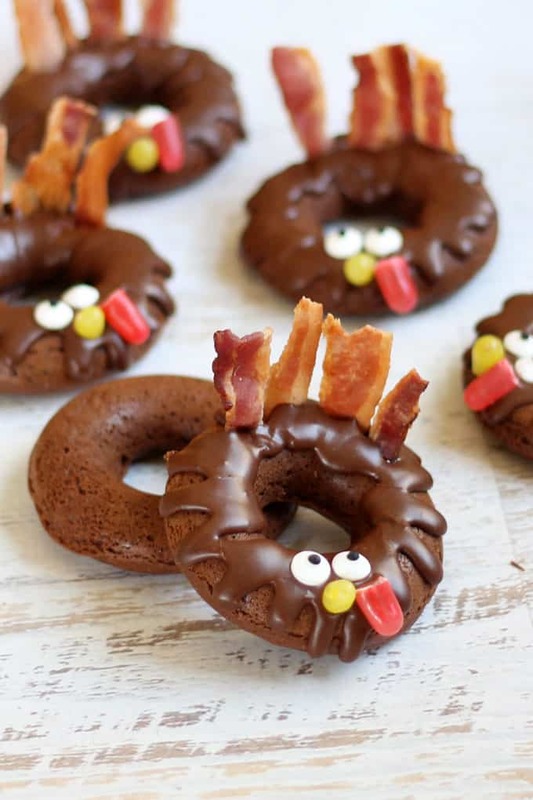 This recipe makes 10 donut turkeys and fills only half of the donut tray. 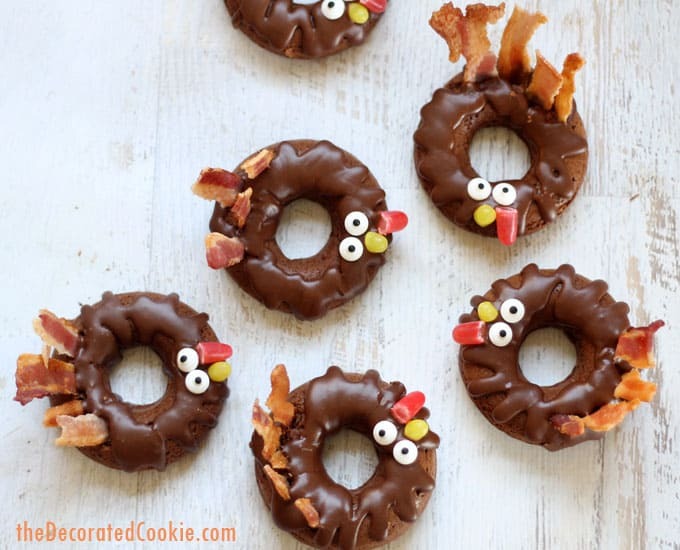 If you have a lot of people wanting donut turkeys (because duh), you may double the recipe! 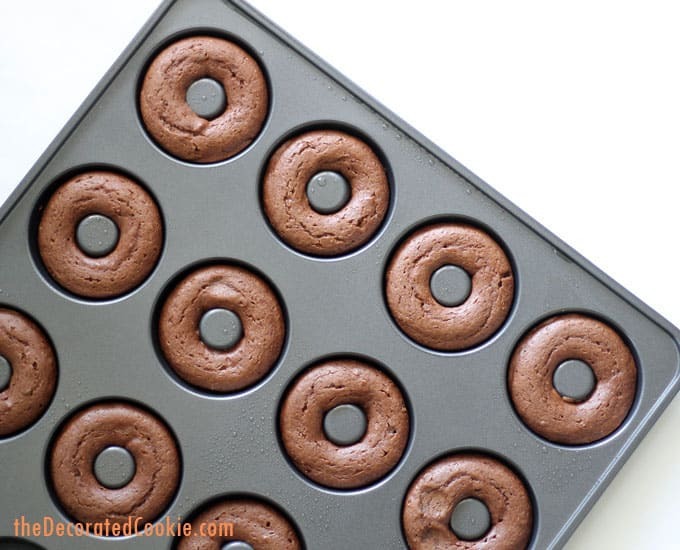 If you need the donut baking tray, find one HERE. Cut or break the bacon into small strips (about 2-inches by 1/2-inch) and insert 4 to 5 strips into the back half of the donut, on the top. Fill the decorating bag with chocolate glaze, close tightly with a rubber band, and snip the tip. 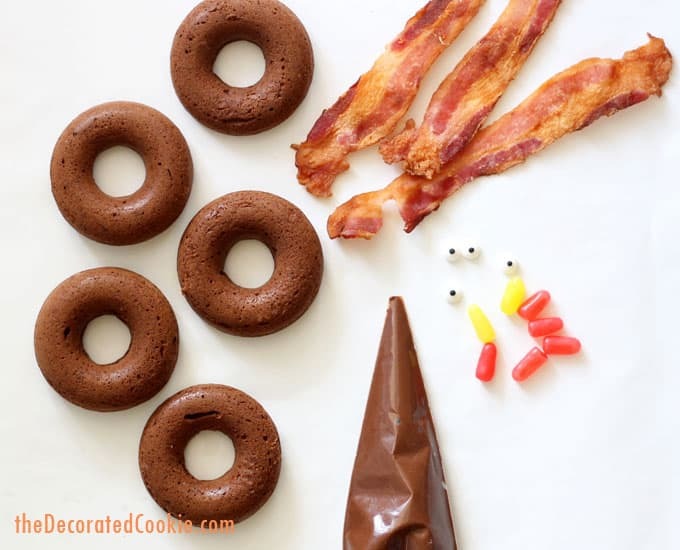 Pipe chocolate around the bacon and back and forth on the top of the rest of the donut. Attach two candy eyes and a yellow and red candy for the beak and wattle. If needed, snip the candy smaller before attaching. Let the chocolate set. Preheat oven to 350 degrees F. In a large bowl or in the bowl of a standing mixer, add the flour, cocoa powder, salt, baking powder, nutmeg (if using), and sugar. Mix together. 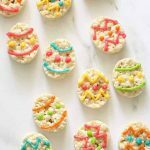 Blend in the milk, egg, butter, and extract(s). Lightly spray the donut tray with cooking spray. Fill the cavities two-thirds full. 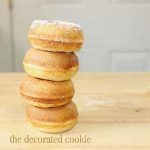 This recipe will make ten donuts. TIP: For a super-easy way to fill the cavities, pour the batter into a Wilton® disposable decorating bag and pipe the batter. Bake until the donuts spring back when gently pressed, 12 to 14 minutes. Let cool completely. For the chocolate glaze, whisk together the sugar, cocoa powder, extract and milk. Add just enough milk to desired consistency. The icing should be thick and pourable, but not runny. In a large bowl or in the bowl of a standing mixer, add the flour, cocoa powder, salt, baking powder, nutmeg (if using), and sugar. Mix together. Blend in the milk, egg, butter, and extract(s). Lightly spray the donut tray with cooking spray. Fill the cavities two-thirds full. 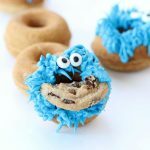 This recipe will make ten donuts. TIP: For a super-easy way to fill the cavities, pour the batter into a Wilton® disposable decorating bag and pipe the batter. Bake until the donuts spring back when gently pressed, 12 to 14 minutes. Let cool completely. Cut or break the bacon into small strips (about 2-inches by 1/2-inch) and insert 4 to 5 strips into the back half of the donut, on the top. 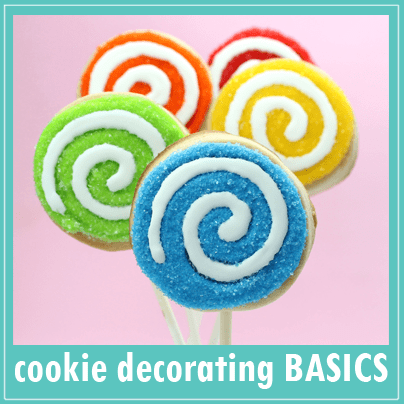 Fill the decorating bag with chocolate glaze, close tightly with a rubber band, and snip the tip. 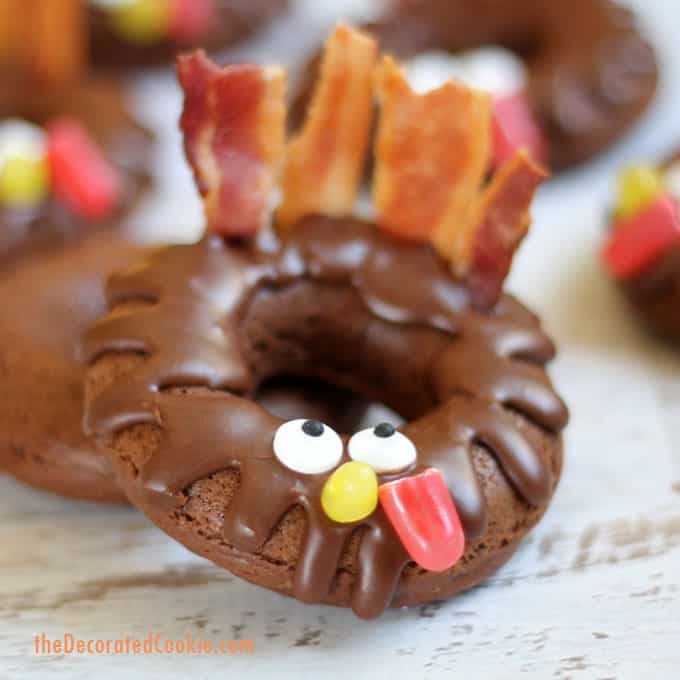 Pipe chocolate around the bacon and back and forth on the top of the rest of the donut. Attach two candy eyes and a yellow and red candy for the beak and wattle. 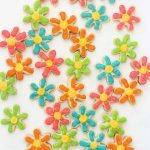 If needed, snip the candy smaller before attaching. Let the chocolate set. Tee hee, thank you so much Karen!! !